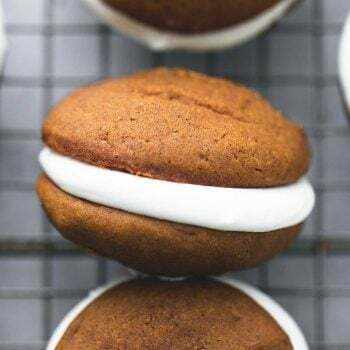 The most incredibly light, airy, and moist gingerbread whoopie pies filled with fluffy cream cheese filling! These cookies are a must-make for the holidays. This post is in partnership with Milk Life. My kids are obsessed with trains. Both of them, the boy and the girl. If there is a train show on Netflix, a train toy, book, picture… they will find it and attach themselves to it like frosting on cake. It’s completely darling and I totally feed into it all the time. We took them on the Heber Valley Polar Express Christmas Train this week and they absolutely lost their minds in awe of it all. You get authentic-looking train tickets and a sweet old man dressed up in conductor garb comes around to punch your ticket after the train gets moving. The whole experience is modeled after the Polar Express book/movie and it’s adorable, right down to the hot chocolate and cookies and dancing train workers. When you reach the “end” you see the North Pole out the train windows and Santa comes aboard the train to sit with each kid and give them a jingle bell. My kids could not have been more enthralled with the whole thing! After two straight days of jingle bell-ing though, I had to hide them, my poor ears couldn’t take it anymore. I’m all about Christmas traditions and since having our own tiny little kiddos I’ve been excited to start some of our own. Two things I know are going straight onto our holiday list of traditions? 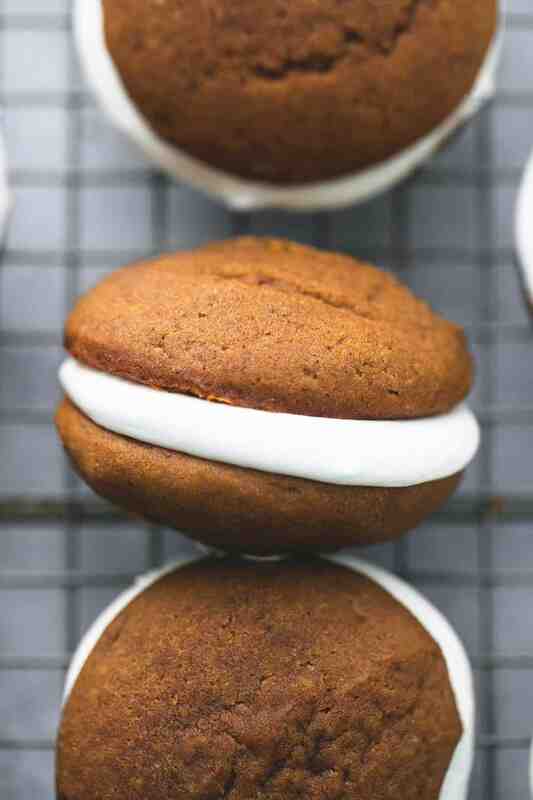 The Christmas Train, and these Gingerbread Whoopie Pies. These cookies are straight heaven in your mouth. I can’t convey enough how perfect they are. The flavor, the texture…. all of it. The cookies themselves are so light, airy, and moist and not dense at all. Like little gingerbread pillows of goodness. And the filling is equally as incredible. So fluffy and creamy and rich, but not overpowering. It’s the perfect compliment to the cookies. 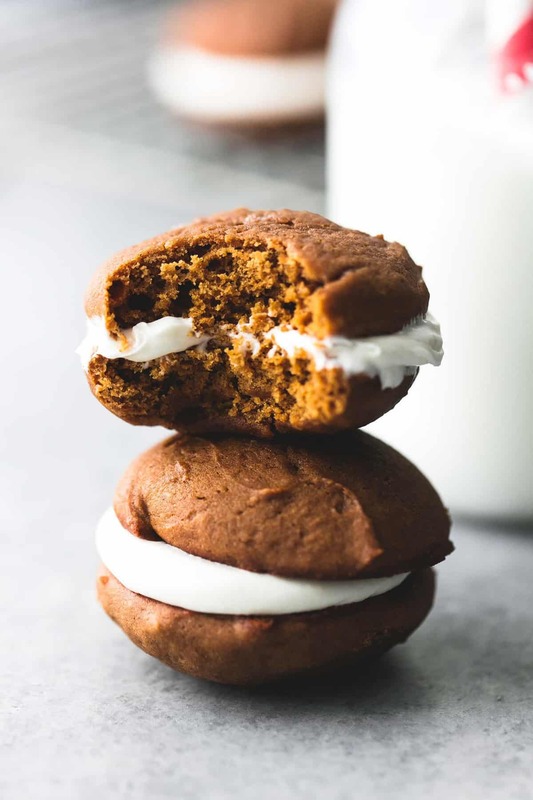 I don’t care what your favorite brand is, you can’t buy whoopie pies this good at the store. This beats them all. Even during the holidays, when we are up to our ears in sweet treats and we indulge at nearly every meal, I try to make sure we are still getting milk into our diets whenever and wherever we can, especially for my kiddos. And nothing goes better with cookies than milk, am I right?? 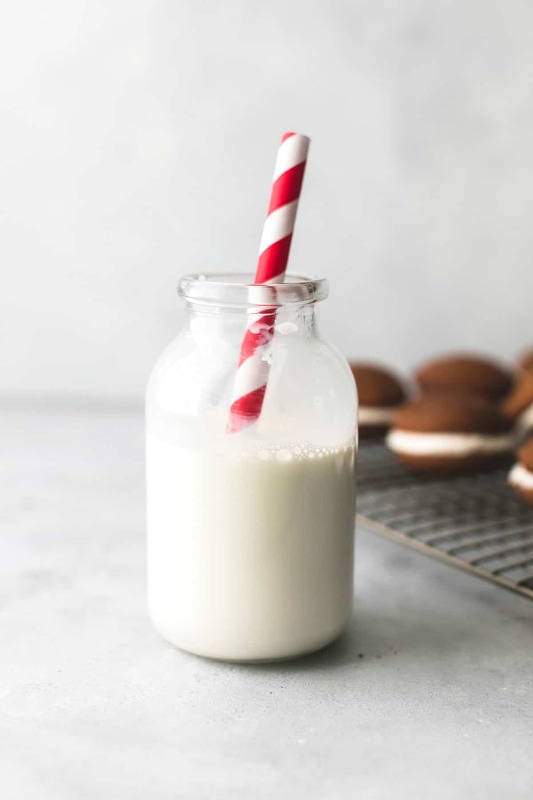 The great thing about milk is that it can be incorporated into our diets in so many ways, including in sweet treats and baked goods like cookies. 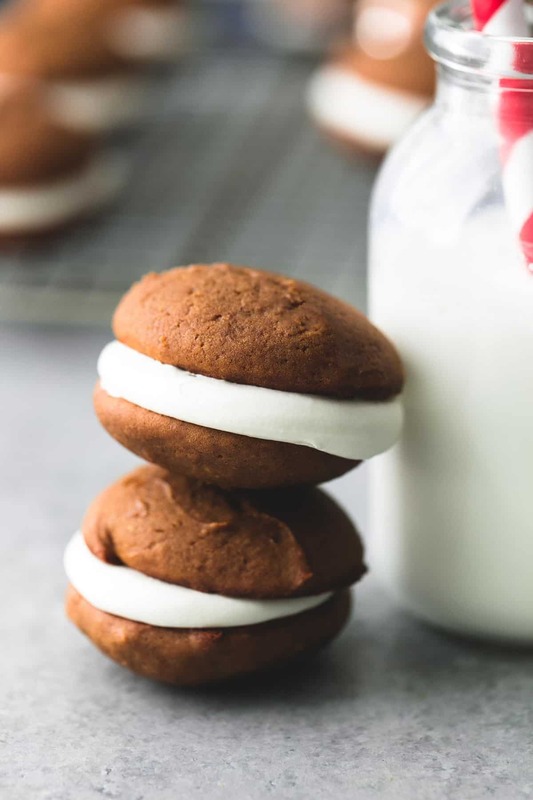 These whoopie pies call for milk in the cookie batter, the filling, and of course you’ve got to serve them up with a tall glass of straight-up refreshing milk. My little boy gets so excited whenever we add milk to a recipe and yells “mix da milk, mix da milk!”, it’s so darn cute. Farm-fresh real dairy milk is at the heart of our holiday baking and helps me to make sure my kids are getting the nutrients they need to grow up strong. Preheat oven to 375 degrees and lightly grease a baking sheet. In a bowl or liquid measuring cup combine milk and vinegar and set aside. In a large bowl cream together butter and sugar until light and fluffy. Beat in the egg. Prepare the filling by creaming together butter and cream cheese until fluffy. Add powdered sugar and mix on high speed for 4-5 minutes. Mix in vanilla, cinnamon, and marshmallow cream. If needed to make a smooth and fluffy consistency, mix in 1-3 tablespoons milk. 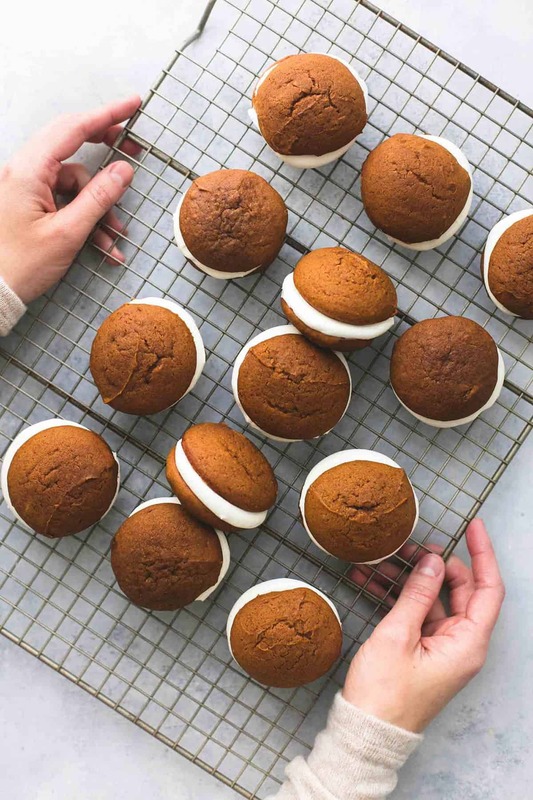 Make whoopie pies by spreading filling between two cookies. Serve immediately or store refrigerated in airtight container up to 3 days. Allow to come to room temperature before serving. Try these other Christmas Cookies you'll love! Hi! What vinegar did you use for the recipe? Thanks.